One of the qualities of chard, besides its wonderful taste, is that it gives me a spring feeling even in the coldest and darkest February evening. The thick green leaves are a promising hint of all the fresh green which will be on my plate in the next months, but for now I gladly enjoy this versatile vegetable. Chard tastes similar to spinach, but stronger with earthy flavours. I like it in combination with pasta and milky cheese. 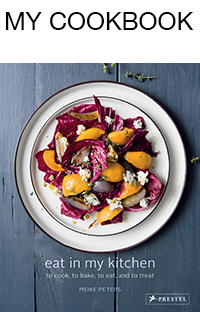 For a quick and easy dinner I chop the leaves roughly, cut the thicker stems into very thin slices, fry them in oil and deglaze everything with a glass of white wine. Mixed with spaghetti, some heavy cream and parmesan it’s a wonderful pasta dish. 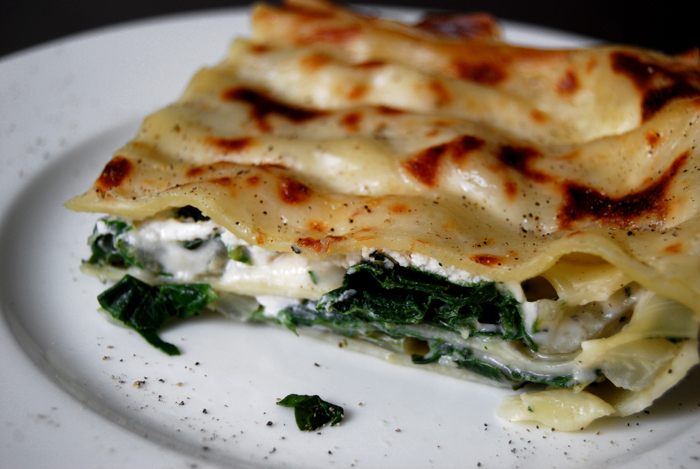 With a bit more time, chard makes a delicious lasagna together with ricotta, Béchamel and some parmesan. For a cold night, I recommend this comfortable dish. It’s done after less than half an hour in the oven, you just need to blanch the chard beforehand and prepare the Béchamel. 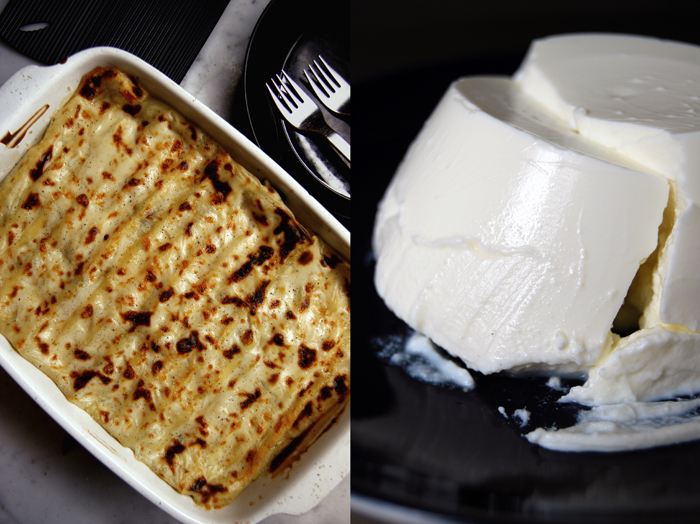 I use a 27cm x 20cm / 10.5″ x 8″ baking dish, definitely big enough for 4 people. Bring a large pot with water to the boil. Cut the soft green of the chard into 1 cm / 1/2″ strips and the hard white parts into very thin slices. Salt the water, first boil the white slices of chard for a couple minutes until al dente, then throw in the the green as well and cook for 1 minute. Take the chard out of the water and rinse in a sieve with cold water for 1-2 seconds. Season with salt, pepper and nutmeg to taste and set aside. Mix the milk with the nutmeg, salt and pepper and bring to the boil. In a sauce pan, melt the butter and whisk in the flour. Pour the hot milk into the roux and continue mixing till smooth. Add the bay leaf and simmer for around 5 minutes on low heat until the texture is thick and smooth. Take the bay leaf out and season with salt and pepper. Set the oven to 180°C / 355°F and butter the baking dish. Put down a layer of pasta in the baking dish, spread with 1/2 the chard, pour 1/3 of the Béchamel over it and sprinkle with 1/2 of the ricotta (in big lumps). Repeat with another layer of pasta, the rest of the chard and ricotta and 1/3 of the Béchamel, cover with the final layer of pasta and the remaining Béchamel. Sprinkle with parmesan. Bake for 25 minutes or until the pasta is done, switch on the grill for 2 minutes or until the pasta becomes golden brown and partially crisp. Yes! This is definitely how I feel about food at the moment; I want lots of green in there! 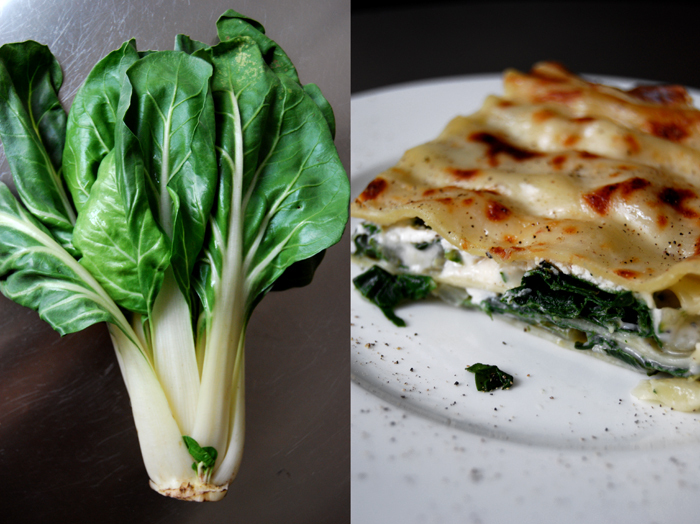 Hi Meike, thanks for the idea of using chard in lasagna, I will try it! A quick question- do you preboil lasagna noodles, or use a no-boil kind?